The scale commonly known as “equal tempered” has been used in western society for the last two centuries. It followed the temperaments of the baroque period, known as “unequal”, which were designed to reduce the number of notes needed for the harmonies of that time, making it easier to play certain instruments whilst maintaining an acceptable degree of accuracy of tuning. The “12-note equal temperament” scale, which has become the standard scale for western instruments, evens the scale to identical intervals in each key, at the expense of precision in tuning, since apart from the octave, the other eleven intervals it contains are more or less “out of tune” on an acoustic level. Alain Daniélou’s theory, delivered in his work Sémantique Musicale (“Musical Semantics”), first published in 1967, is the fruit of many years of research and experimentation in Indian modal music as well as other eastern musical traditions, and offers a novel approach to our perception of relationships between pitches. The system he elaborated belongs to the family of just intonation scales, also called “natural” scales. This implies that the intervals it is composed of are expressed in the form of ratios made up of whole numbers to both the numerator and the denominator, which as a result creates harmonic ratios between all the notes of the scale, in this case 53 per octave. The particularity of this scale is that it bestows a special value to harmonics 2, 3 and 5 and their combinations. According to Alain Daniélou, the intervals created from these 3 factors have the power to provoke precise and apparently universal feelings or emotional reactions in humans. These two specificities; the fact that it brings together 5-limit just intonation intervals, and that they contain an expressive content, is also found in the Hindu musical theory and its 22 shrutis. Nowadays all that is required is to link a keyboard to a computer and to download these virtual instruments and in a few clicks all the sounds one could possibly imagine become available. 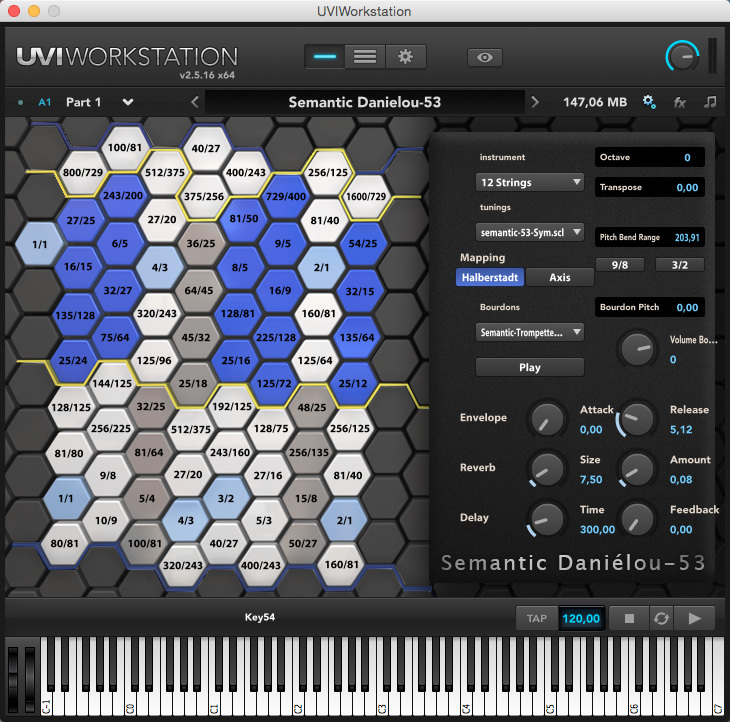 What could be more logical for the FIND Foundation, after financing the production of a real instrument – the Semantic Daniélou-36 – (whose 2nd version also integrates a virtual instrument) than creating a software version, with the “Semantic Daniélou-53” ? In order to undertake this project, the Foundation called upon the services of Christian Braut and his company, Archipel Studios. A partnership was established with one of the major names in the field: UVI Sounds & Software. 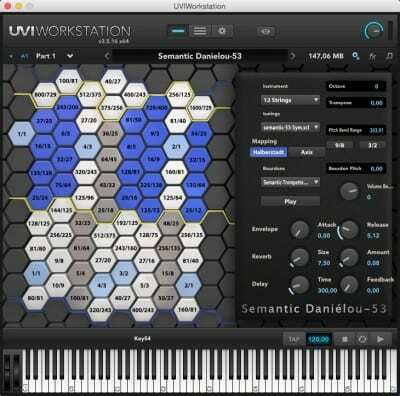 UVI instruments have gained notoriety and been used by professional musicians throughout the world in the last ten years, using software such as MOTU MachFive™, Ethno™, BPM™, Spectrasonics Stylus™, Atmosphere™, UVI and Workstation™. The project’s management (choice of sounds, scales, etc.) was placed in the hands of Jacques Dudon, an internationally renowned microtonality specialist. Microtonal composer, researcher, instrument maker, multi-intrumentalist and current director of l’Atelier d’Exploration Harmonique (“Harmonic Exploration Workshop”), Jacques has invented over five hundred instruments which explore new acoustic ecologies. He has collaborated with the Foundation on several occasions, in particular providing his expertise on the Semantic instruments as a musician. Following this work, in 2007 his group of musicians, l’Ensemble de Musique Microtonale du Thoronet performed in the Abbey of Thoronet, Rome, Venise and Paris, for the “Semantic Works” european tour.